BlytheLife.com » Interview with Anne and Susan of AnneArchy! As part of the March Talent Showcase, I had the pleasure of interviewing the sisterly duo behind AnneArchy, a fun Etsy shop that sells things for Blythe as well as things for other human companions and things for people! Susan and Anne are the two lovely sisters behind AnneArchy and they were gracious to answer some questions that I had for them! Hi Anne and Susan! What can you tell us about yourselves and how you discovered Blythe? Susan: I’ve always been pretty crafty. I learned to sew at a young age from our Mom and always enjoyed it. I love making things and having a product to show people when I’m done. I like that handmade items aren’t necessarily perfect and that it shows the love that was put into making it. I discovered Blythe though Anne and was fascinated by her look and her large following of super crafty people. Anne: Like my sister, I’ve always been pretty crafty. I was in 4H when I was a kid, and our group was called Busy Bobbins. We did sewing and related crafts and it helped me develop an appreciation for my ability to create something useful or wearable. That feeling is so satisfying! I now like to sew and knit, as well as general crafting, and I’m hoping to teach myself some more advanced embroidery techniques in 2011. I discovered Blythe through Morganannie, who I know professionally (she and I have similar day jobs: we’re both librarians in Michigan), and the more I saw her beautiful creations, the more I knew that I needed to try it myself. When and why did you decide to start making things to sell for Blythe? Susan: While looking around at Blythe online I saw a lot of the awesome handmade items that other people were making and wanted it try it myself. My very first attempts at sewing over 20 years ago were stuffed animals and clothes for them, so it felt very natural. Anne: Like I mentioned, Morgan got me hooked, and as soon as I got my first Blythe (a Prima Dolly Ashlette, who I call Willow), I jumped right in and started sewing for her. It was in November of 2009 that I got Willow, and I sold my first dresses later that month! Susan and I already had the AnneArchy shop on Etsy, so we just expanded our offerings to include stuff for Blythe. What kind of places do you draw inspiration from for your crafts? Susan: I find a lot of inspiration looking at fabric, at the fabric store, online, or in my stash. I also look at colors and patterns in daily life and think about how that might translate into an outfit. One of my favorite dresses was inspired by a dress worn by the daughter of a high school friend. Anne: Susan and I are pretty similar here – looking at the raw materials provides a lot of inspiration for me, too. The feeling of being at a fabric store and having all that awesome pattern and color around you – who wouldn’t be inspired? I also get excited by looking for little doodads and embellishments that I could use on clothing for Blythe. Sometimes you can find things in unexpected places (tiny flowers at the dollar store? perfect!). I also get inspired by the dolls themselves. 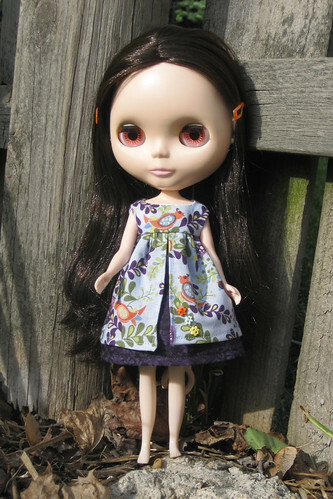 Each Blythe has her own personality, and it’s fun to create clothing that suits a girl. What would you say sets your things for Blythe apart from all the other things on Etsy? Susan: Anne’s sweaters, hands down. They are amazing! From form fitted to comfy oversized, they are perfect. Plus with the custom listings you can create your own color combinations, how cool is that? Love them. Anne: *blushing from flattery from the sistrah* I’d say that we really take a lot of care to make sure that our items are detailed and well-made. We both craft for the fun of it and we take pride in our work, so we end up with quality items to offer to other Blythe enthusiasts. Not that everything else on Etsy isn’t quality, of course! I just think we do a darn good job. How does it make you feel when you see photos of your dollywares on other people’s dolls online? Susan: I get super excited…every time. I love seeing pictures from customers, and I show everyone! That feeling hasn’t diminished, selling each dress is extremely validating that someone thought my product, the thing I made, was pretty and their special gal would like to wear it! Biggest warm fuzzy ever. I am amazed and gratified all over again every time a dress sells and it makes me antsy to get back into CraftyTown. Anne: Oh, yes! I love it! 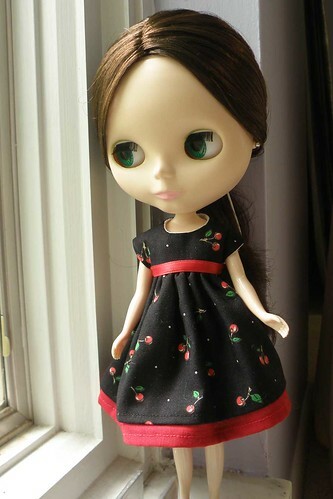 It is SO neat to see how people put our items together with clothing from their existing wardrobes, and to see how an item we’ve made can suit a Blythe so well! I get excited about it every time, too. What kind of process do you go through when making new things (from start to finish)? Susan: I often start with a fabric that I’m really digging that day, sometimes its a color (the other day I made 5 different dresses all of the fabrics were some shade of blue). Then usually decide what dress style would go with that fabric and if a contrast color might be nice. Every now and then, its the embellishment I fall in love with and I find a fabric that I think would highlight it. Then I sew. I tend toward doing one dress start to finish before moving on to the next one. Anne: For me it really varies on my mood and which craft I’m doing. For sewing, I usually spend some time staring at the fabrics and embellishments I have in my stash,and then at a certain point I’ll start matching them up. I like to do things in batches most of the time, so I’ll usually match up some fabrics and embellishments, cut out a bunch of them to the size pieces I need, and then sew. I usually do my Blythe knitting on my lunch hours, so I have a little knitting bag in my purse that I take out to a quiet spot and then knit while I listen to an audiobook on my iPod. I almost always have an idea in mind when I pick out the yarn, so I usually start by knitting a bit and seeing what happens – I have some basic patterns I’ve created and I’ll play with one to see if I can change it to get the effect that I’m hoping for, and see if it turns out. I sometimes don’t like what happens and rip it out and start over, but with Blythe stuff, it doesn’t take long to figure that out so it’s not much time spent re-doing things. When I’ve finished knitting the item, I’ll weave in the ends and do any other finishing stuff that needs doing. Then later when I’m at home, I’ll sew on snaps or embellishments or whatever, and I usually am inspired to take a photo of it right away. I love to see how things look on Blythe once they’re finished! How much time do the two of you spend on AnneArchy in, say, a week or a month? Susan: I’d have to say I probably spend at least 10 hours a week, but it does vary with what the rest of life throws around. Anne: I work full-time (sometimes more than that), so I don’t have a ton of time to devote on workdays. I can usually count on 3 or 4 lunch hours per week, but that varies with how busy work is and whether I have any work-related lunch appointments. I try to make at least an hour or two on my days off, so I’m probably somewhere around 6-8 hours per week, and more if I’m lucky! I do try to carve out an extra day here or there that I can take off as vacation or personal time when I can really devote myself to working on Blythe stuff all day. That is so much fun, but it only happens every few months. How has running an Etsy shop changed the way you view other Blythe-related Etsy shop owners in the community? Susan: I think it makes me appreciate the items that others make. Knowing everything that goes into making them, from finding the time to craft, the imagination for ideas, to the execution of some seriously amazing stuff. Every time I look around Etsy for items for my own gal I’m always finding tons of things and more often whole stores I add to my wishlist! Anne: Susan really summed this one up well. It is so neat to really understand what it takes to make something, and see all the effort that others have put into making items for Blythe. It’s also really cool to see all the creativity people show in their creations. How has working together made your sibling relationship change, if it has? Susan: I think its made our relationship stronger. I moved across the country a short time before we started our Etsy shop and I struggled with the separation from family and friends. Having this shop and all the awesome items she is always coming up with gives us more excuses to call each other or chat online. Plus having someone to share ideas and problems with is invaluable, she’s always encouraging me and pushing me to do more. Anne: Again, I agree! When Susan moved to Florida, it seemed like the hugest distance from Michigan! It’s so neat to have a common interest and endeavor that we can share like this. I’m so happy that I encouraged Susan to get into Blythe, too! What kind of marvelous things can we expect to see from AnneArchy in the future? Susan: More designs, different fabrics and trims, all showing off the awesomeness that is Blythe! Anne: I hope that I’m going to continue to expand the types of knitted items that I make for Blythe, and also to different types of sewn items, too. I’d like to make more hats, and to perfect a skirt pattern that I’ve been working on. I’m more of a separates gal in my own wardrobe, and I’d like to make more separates for Blythe, too. Thank you so much to the both of you for doing this interview with me! What kind of advice would you give to someone who’s new to the Blythe hobby? 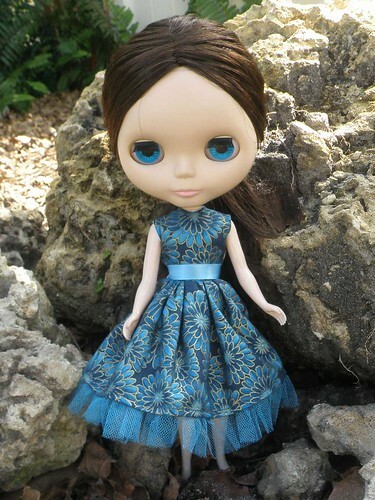 Susan: Sharing this hobby with other people who also like Blythe is super fun and there are so many places to find kindred spirits with a love of Blythe. So I would encourage folks to find some fellow Blythe peeps. Join forums, investigate a meetup, share the Blythe! 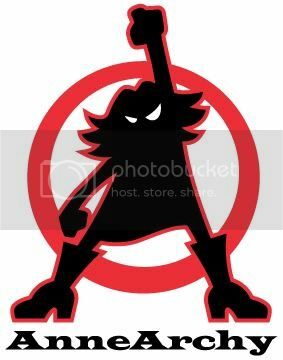 And for those considering making things for their gal, go for it! Anne: Again I’m going to echo what Susan said – just go for it! There’s no shame in making something that doesn’t turn out exactly how you’d hoped – if nothing else, you learned something! And that in itself makes it a success. It’s really neat to form friendships with other Blythe enthusiasts. There are people from all over with so many other interests as well. I’d also say that joining swaps is a really great way to share the love of Blythe with others. You get the fun of picking out items for someone else, and then the treat of seeing what your swap partner chose for you! Great interview! Anne and Susan are amazing and I love their work! Thank you so much, Johnathon! Your photos always make our stuff look extra awesome! I’m so glad you like them, Emily! What a great interview! I love how creative both Susan and Anne are, I don’t think my sister would be interested in doing a shop with me, both of you are very lucky! Hee, well, I tried to put a nice spin on it. Love you too!